Grade Lvl: T Author: McClannahan, Lynn E. Krantz, Patricia J. Describes scripts that parents and teachers can use to help children learn to initiate conversation, thereby improving communication. 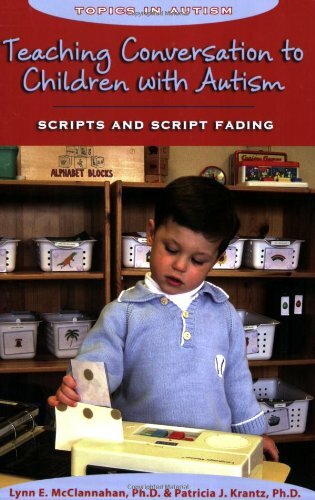 A script is an audiotaped or written word, phrase, or sentence that often reflects the child's preferences and interests. For very young children and non-readers, scripts are paired with pictures of desired objects or activities. The process starts when a child engages in conversation with an interaction partner by reading a script or playing it on an audio card reader to start the conversation. The intervention strategies described in the book are based upon the science of applied behavior analysis.